Hi everyone, it is good to be back. Ok so it has been a while since I have posted a recipe. I took a short sabbatical, I had to focus on something else! Did you miss me? Hopefully the saying “absence makes the heart grow fonder” is true! So summer has finally arrived. Honestly, I feel quite blessed to live in the Northwest considering the surreal heat wave that has blasted the rest of the country (only California, Oregon and Washington have been spared!) We may have less sun but regular moisture is a nice thing to have with global warming wrecking havoc all over the world. 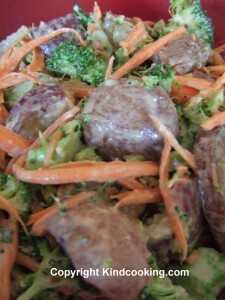 But I digress… summer means salads and what is a party without a vegan potato salad? Well, this one is guaranteed to make people talk and come back for seconds! Don’t say anything, just bring it and watch what happens! 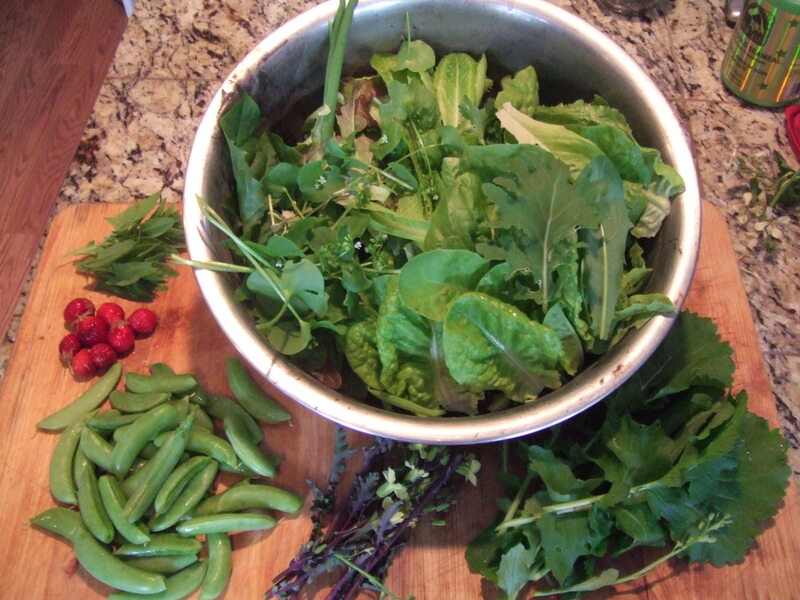 I must say that I have been enjoying fresh salads from our garden with all kinds of lettuce, some kale, fresh peas… what a blessing to be able to walk anytime to a patch of fresh fruit and vegetables and harvest our treasures as they make themselves available to us. 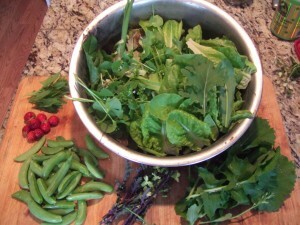 I have also been craving lately for salads with more sustenance. So I decided to add fresh broccoli, some carrots, some peas even. I also happened to have some oven roasted potatoes I had made for a dinner the day before. So I thought, why not combine them together. Now, since I love chipotle sauce, I decided to try it on it. I can put it on just about everything. Wow! 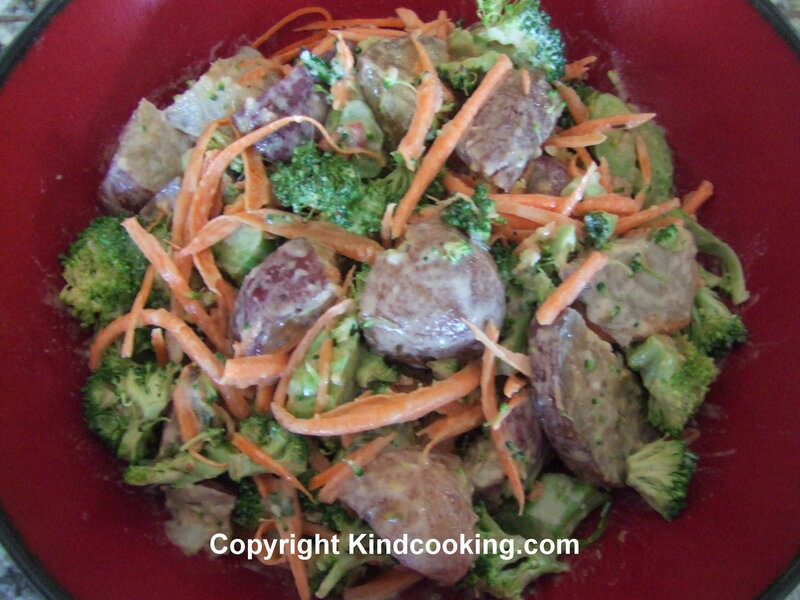 The result was a wonderful rich flavor with crunchy bites… I think that you will love the combination of raw and roasted vegies with a fun chipotle sauce. Vegenaise is the best tasting vegan mayonnaise on the market. The good news is that if you make a potato salad or coleslaw for a pic-nic, you never have to worry about food poisoning from the mayonnaise because there are no eggs. If you want to make a chipotle dip, use less non-dairy milk. If you want to make salad dressing add more. You can use more chipotle if you like it more spicy. Taste and add accordingly. Chipotle usually comes in small cans and can be found in the Mexican section of most grocery stores. I pour the chipotle in a small ziploc bag and freeze it since I only need a small amount. A little goes a long way. Make sure to double the recipe because it will go very quickly!